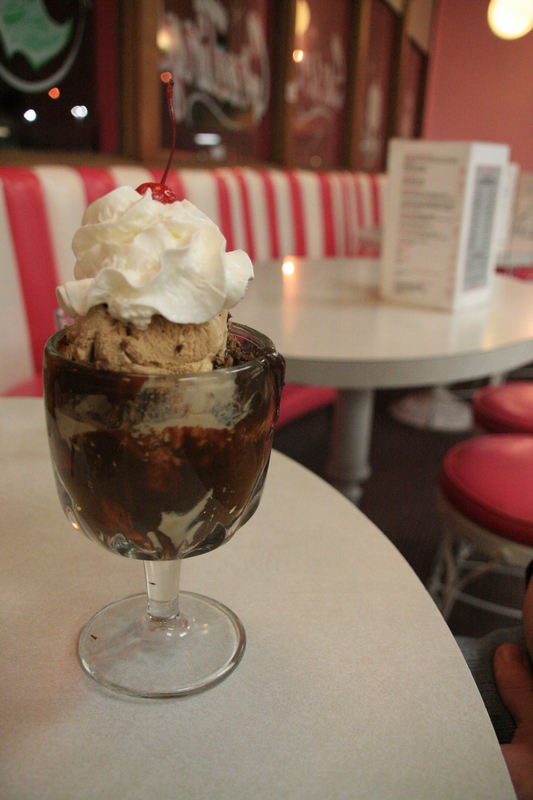 Pink stripes aside, Loard’s ice cream is legendary. It is deliciously creamy and the choice of flavors is unrivaled (that is, I think there are more than 31 flavors, right?). There’s a menu filled with fabulous concoctions to get you started on choosing your after-dinner (or pre-dinner, after-lunch, first thing in the morning…) delicacy , but anyone working there is happy to substitute butterbrickle ice cream for vanilla, add extra caramel or hold the whipped cream (though I’m not sure why you’d want to). Coffee ice cream sundae with chocolate syrup, toffee bits, whipped cream and a cherry. 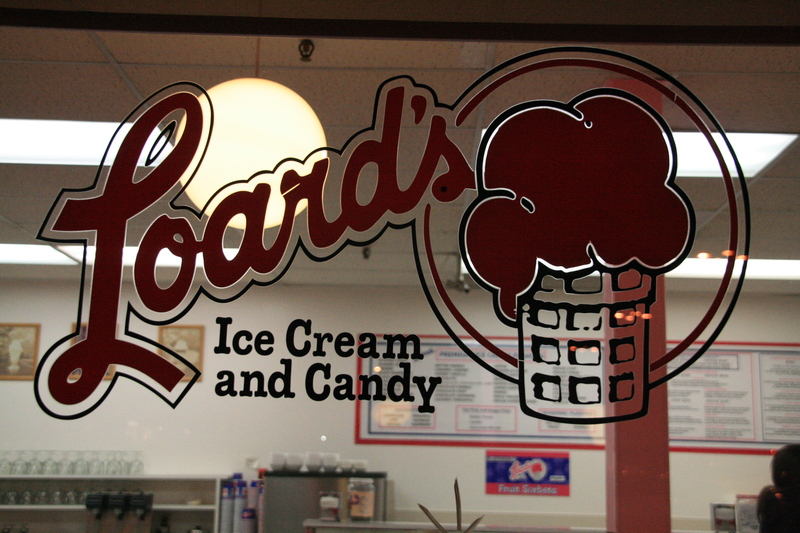 As long as I’ve been frequenting Loard’s, I’ve experienced superb ice cream, exceptional hot fudge, professionally constructed desserts, friendly service, and reasonable prices (although it isn’t cheap, but that’s because it’s so good!). I bring friends, family, visitors, strangers…anyone who wants dessert, I always know where to point them. And supposedly, as the back of the menu informs me, there are many other Loard’s locations around the bay – San Leandro, Oakland, Alameda, Livermore, Danville, and Alamo to name a few – though I’ve never been to or even seen these other stores. But, I have faith that Loard’s tells no lies, so I will believe them that the stores are where they say and that they are equally as yumalicious. Writing this is giving me quite a hankering for some frozen delights – see you at Loard’s! I went there this evening, as I love Loard’s ice cream as well. There is nothing better! I do not enjoy the ambiance quite as much as you, but it was warm inside while freezing outside, so it was comfortable and welcoming. mmmm….Loards! Yes, it is very delicious ice cream. I guess lots of people agree cuz it’s been in business at least 40 or 50 years. You make me hungry!!!!! That’s a good thing!!!!!!!!!! Hope ou can visit C-10 again!!!!!! Hi Benjamin, I love being hungry, it means I get to eat soon! 🙂 I hope I can visit you guys again soon too, thank you for being so nice to me when I was there; I felt very welcome! Your Grandmam used to always have Loards ice cream in her freezer. Rocky Road and vanilla as I recall. Heck, I can remember when they were across the way in the Village, on the corner. We’d get a cone and leave via the alley in back. I grew up in Castro Valley and have great memories of getting Peter Pans at the Loard’s in the Castro Village. Visited the Loard’s in Modesto tonight and was disappointed that the shop did not have any of the same charm. Not only did the Peter Pan not have peppermint ice cream. they didn’t even carry peppermint ice cream in the store. Sad.